Only natural flavours. No calories or sugar. No added preservatives. This product is GMO free. This product is gluten free. This product is allergen free. This product is suitable for vegetarians/vegans. Love it light? Add some sparkle to your day, minus the calories with Diet Coke Diet Coke is a sugar free, low calorie soft drink. No Sugar No Calories Gluten-free, dairy-free and nut-free Contains vegetables extracts and sweeteners Serve over ice with a slice of lime. 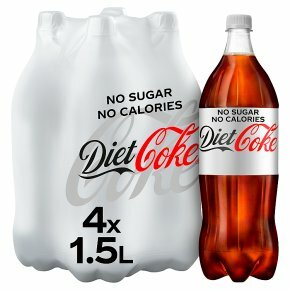 Contains 6 x 250ml servings. Keep cold in the fridge. Please recycle.